Albany, CA is the bay front city just west of Berkeley and immediately south of El Cerrito. Albany is a coveted destination for home buyers due to its highly rated school district, its proximity to shopping and dining on Solano Avenue and its easy access for commuting. It’s relatively small with a population of about 18,500 and has a small town vibe with a supportive and involved community. Its homes are predominantly designed in the California “Bungalow” style and many were built in the 1920’s – 30’s. Single family home values for Albany Real Estate range from the $800,000’s while the waterfront condos on Pierce Street, next to the highly regarded 99 Ranch Asian mall offer more affordable options ranging in the $400,000’s. With easy access to I-80, Bart, casual commuting to San Francisco and the University of California at Berkeley (Cal), Albany, CA is an appealing Bay Area home destination. If you are looking for homes for sale in Albany, CA, Feagley Realtors has an office right in the heart of Albany on Solano Avenue to help you explore this coveted location with a local’s eye and knowledge. Curtis St./Solano Ave. The northeastern portion of Albany features large homes on verdant streets. On the thoroughfare there are lots of little boutiques like Oaks Jewelers and award winning restaurants like Zachary’s Chicago Style Pizza; old faves like Peet’s and Starbucks; and new fun places to sample like Xocolate Bar. Marin Ave./Ordway At the southeastern most part of Albany, this neighborhood shares Solano with the Curtis/Solano Ave section, but has soft rolling hills leading to Berkeley. The southern part of this section is close to Monterey Market, an intimate grocer with a wide assortment of fresh organic produce; Espresso Roma Cafe, a fun italian cafe with outdoor seating; and Country Cheese Coffee Market, where you can sample coffee or cheese (or both) to your heart’s content. San Pablo/Washington East of San Pablo from Solano north to the El Cerrito Shopping Center. This neighborhood is home to beautiful, cozy more affordable cottages. Solano offers a whole host of cafes, fun eats like Mr. Dewie’s (icecream made from cashew milk) and the Albany swimming pool. From Solano, it’s 4 blocks to the El Cerrito Shopping Center and just 2 more to the El Cerrito BART Station. City Center East of San Pablo and South of Solano, this neighborhood includes fun little cafes like Hal’s Office with it’s new crowdfunded parklet, the Tay Tah Cafe which also offers yummy vietnamese sandwiches, and exotic eats like Oori Rice Triangles. The Ohlone Bike Path leads you down to Berkeley and the new outdoor Beer Garden, Westbrae Biergarten. Buchanan Ave. / Jackson West of San Pablo on the hill and everything north of Buchanan Avenue, you find a continuation of the cute cottage homes found east of San Pablo; posh pads on the hill with amazing views on the water and the city; and the more affordable condo apartments on the other side of the highway. The neighborhood is home to the northern part of the Albany Bulb, an off-leash playground for pups and Albany Beach. Buchanan Ave. / Marin Ave. West of San Pablo and south of Buchanan, you find lovely homes bordered by the award-winning Oceanview Elementary School and the Gilman section of Berkeley in the south, featuring Whole Foods, Philz Coffee and REI not to mention loads of cute new boutiques and microbreweries. Are you considering a move to Albany, CA? If so, here are the top ten reasons why the realtors at Feagley Realtors love Albany. Albany is an excellent location for commuting – whether to nearby business centers in Oakland and Emeryville, or across the bridge to San Francisco. We have a variety of public transport options including BART and AC Transit. In addition, the less know casual carpool is an unofficial, but convenient ride share program which has a stop in Albany just across the street from the Pacific East Mall on Pierce Street. There is also a new ferry line currently being built close by in the Marina Bay neighborhood of Richmond which is a 10 minute drive from Albany. The ferry will provide a direct high speed and – we think – very enjoyable ride to downtown San Francisco. Many people, including some of our realtors, originally chose Albany because of the excellent schools. According to school-ratings.com, Albany High scored at 97.3, which places it at a higher rank than any of the schools in the neighboring East Bay towns and second only to Piedmont. The elementary and middle schools are similarly highly regarded. We know that school testing doesn’t tell the full story. Albany is also a great place to educate your children because most residents live within walking distance to the schools. Albany is one of the few bayfront towns that has a small town vibe where kids can still bike and walk to school. While there are no guarantees in the real estate market, buying a home in Albany, CA is a safe bet for steady increases in property values. If you are looking for Albany home for sale, you’re likely interested in the top-rated schools. But even if not, you should consider the fact that the top schools lead to high demand for homes. And high demand usually equates to steady increases in Albany real estate home values. 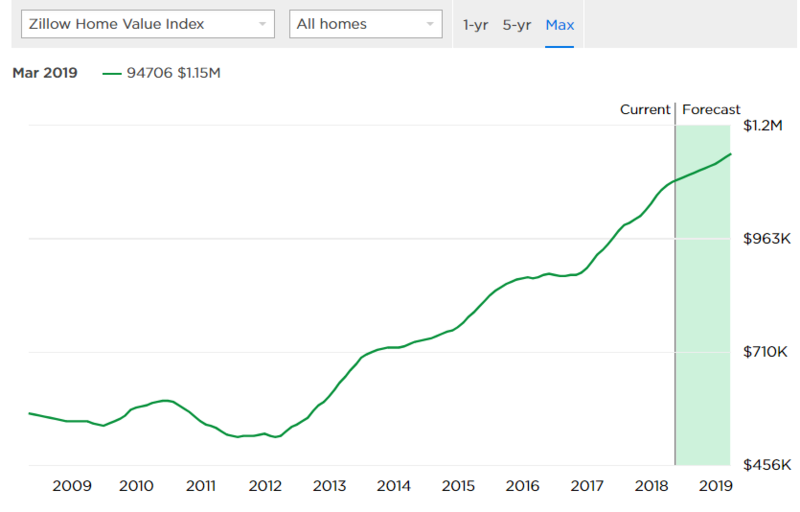 According to Zillow, home values in the 94706 zip code have gone up 15.2% over the past year and Zillow predicts they will rise 6.6% within the next year. Those numbers compare favorably even to the nearby Berkeley Hills neighborhood which is also a highly desirable neighborhood. In the Berkeley Hills, properties have seen a 7.9% one year change and Zillow predicts a 1 year increase of 4.8%. We particularly love Albany for it’s friendliness and small-town vibe. With kids walking to school and people strolling along Solano Avenue, there are plenty of opportunities to see neighbors and catch up on gossip. We like to think of Albany as a small-town oasis in the midst of a larger urban area. Located on the waterfront on the border of Albany and Berkeley is Golden Gate Fields, the horse track with a view. Golden Gate Fields is currently Northern California’s only major racetrack. Whether you want to make a wager or enjoy the views and fine dining at the Turf Club, Golden Gate Fields provides an excellent way to enjoy a sunny day in Albany. Unlike most professional sporting venues in the area, we love the fact that GGF is still affordable. Every Sunday during the racing season is Dollar Day which means $1 General Admission, $1 General Parking, $1 Programs, $1 Hot Dogs, $1 Beers and $1 Sodas. With its top-rated schools and proximity to UC Berkeley, it’s perhaps not surprising that Albany has a highly educated population. But even us long-time residents were surprised when we looked up the statistics and found that according to city-data.com, Albany, CA ranks 2nd in the Bay Area as the town with the highest percentage of residents who hold a doctoral degree. With 12.2% of the population having earned doctoral level degrees, the only Bay Area town with more brain power is Stanford, CA. Other statistics about the education of Albany residents were equally impressive. In Albany 96.1% of the population over 25 has attained a High School diploma or higher and 73% have earned a college degree. That’s a higher percentage of college grads than any of Albany’s neighboring cities including Berkeley and is in line with other desirable Bay Area cities like Lafayette, Danville, Corte Madera and Moraga. It’s a little-known fact that Albany has its own beach. Located behind the Golden Gate Fields race track and next to the Albany Bulb park, the beach is a great place for a quick get-away to bring a dog. Albany beach is also used by wind-surfers and kite surfers. It’s known for its beautiful sunsets from where you can get a full view of the Golden Gate Bridge. Many Albany, CA home for sale that are located on the bay side of Albany Hill have a great view of the beach and the Golden Gate Bridge. Wednesday Evenings in September, when the weather is at its warmest, community members gather at Memorial Park to enjoy the annual Music in the Park concerts. This year, the 2018 concert series will be Albany’s 15th season of providing free concerts every Wednesday night in September from 6:30 – 8:00. The concerts are great for families who set up blankets and enjoy a summer picnic. This year’s schedule begins on Sept 5th. Albany also boasts a top-notch library, community center and aquatics facility. The community center offers camps and adult education classes. The Albany Aquatics facility offers both indoor and outdoor pools and Albany offers swim lessons along with kids and adult swim teams. We know that the prices for single family homes are difficult for many people – especially for families who are looking for their first home purchase. If you are looking for Albany homes for sale with a lower entry point or are looking for a rental, you might consider the condos on Pierce Street. There are several condo complexes in Albany which front Albany Hill and offer amenities such as pools, tennis courts and gyms. Many of the Albany condo units have world-class bay front views. In addition, they are located within walking distance to the Pacific East Mall which offers a variety of restaurants and houses the 99 Ranch Grocery Store. The condos are also across the street from an easy casual carpool commuter stop for rides to San Francisco. According to the city-data.com crime index, Albany scored a 166.1 in 2016 (the most current year that the site keeps statistics). That low crime score is significantly better than the scores for the neighboring cities of El Cerrito, Berkeley, Richmond, Oakland and Pinole. If you are looking for homes for sale in Albany, CA, you should consult with the experts at Feagley Realtors. We’ve been helping buyers, sellers and renters in the East Bay since 1966 and are ready to share our wisdom about living in Albany, CA. Our Albany office in located on Solano Avenue incudes realtors and property management experts. We’re looking forward to meeting you and welcoming you to the community.